The area takes its name from Spinningfield, a narrow street which ran westwards from Deansgate. In 1968, Spinningfield and the area to the south were turned into Spinningfield Square, an open paved area. In the background here is the now demolished Northcliffe House on Deansgate, the former Daily Mail Building. The proposal to create a central business district originated when Allied London purchased a number of buildings around the John Rylands Library. Allied London CEO Michael Ingall was the driving force behind the site's regeneration, and Manchester City Council was keen to redevelop the city centre after the 1996 Manchester bombing. Following the demolition of the old Manchester Magistrates' Court, the vacant space became Hardman Square, a new public realm area created in the centre of Spinningfields. The area was never intended to be a permanent public space, but Allied London later decided not to develop on the land and instead leave it as a green area. The area in the foreground was developed into The Oast House in 2010. Hardman Square became home to The Lawn Club, a quintessentially British bar, which Spinningfields will bid a sad farewell to in August 2016. This area also hosted Screenfields, Spinningfields’ incredibly popular outdoor cinema. 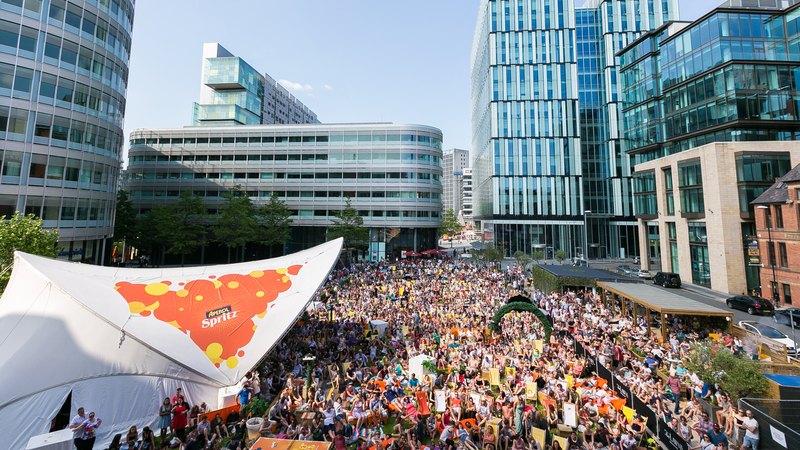 At its peak, Screenfields welcomed over 2,000 people, the highlight of which was Andy Murray’s 2013 Wimbledon victory. The XYZ Building, another of Allied London’s landmark developments, close to Left Bank, was completed in 2016 and is a new and radical benchmark for cutting edge working culture, and features an events space, co-work area, coffee shop, and Drake and Morgan’s ‘The Refinery’ restaurant. The building is home to NCC Group, Global Radio, and Shoosmiths. In January 2014, Allied London submitted plans for the demolition of Quay House and the construction of No1 Spinningfields, a 19-storey high-rise. The building will feature a specialist M&S food hall, a coffee bar, and D&D London’s incredible top floor restaurant. The development signifies the final piece of the Spinningfields puzzle, with the public space in Hardman Square being reclaimed following No1's completion in 2017.